I have mail on my mind. I’ve been—with the help and crayon skills of a small boy of my acquaintance—putting together the annual batch of Christmas/Hanukkah/Solstice/Festivus cards (if you’d like one, blog friends, do get in touch) and reflecting on the very great pleasure a handwritten note can elicit. Earlier this week, I received an unexpected package in the mail—a note and two extraordinarily thoughtful gifts from a friend who visited this summer. This friend (who is a very private person, and who I’ll call L) happens to be one of the most wonderful writers I know; she thinks deeply and expresses herself clearly, and I’m fairly sure that if she had been born 200-odd years ago, she would have been a real-life Jane Austen heroine. L writes gorgeous letters via email, but I am afraid that I have been a terrible correspondent, falling off the epistolary train, so to speak. Fortuitously, as this lovely gift arrived, I was reading a book that suggested to me a way to catch the train again: writing letters. 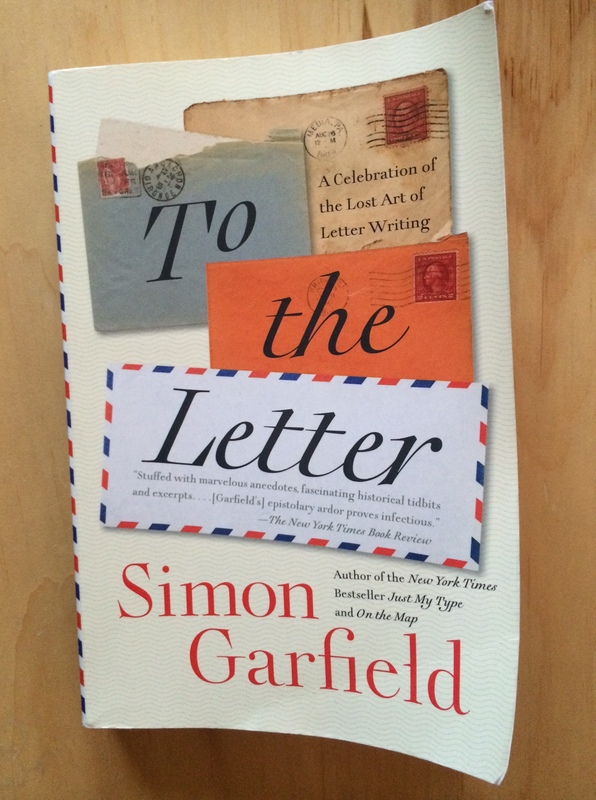 Simon Garfield’s To the Letter: A Celebration of the Lost Art of Letter Writing* is one of the most charming books I’ve read in years. Part popular history, part love letter to letters themselves, it’s an entertaining, lively read that will have you reaching for pen and paper by page ten. I highly recommend To the Letter, especially for anyone (ahem) who reads mostly fiction, but would like to read more nonfiction. And since ’tis the season, friends, I’d also recommend To the Letter as a gift, especially if you pair it with Letters of Note (which I received as a birthday present from my husband—thanks, dear! ), a gorgeous, coffee-table kind of book you’ll actually read. 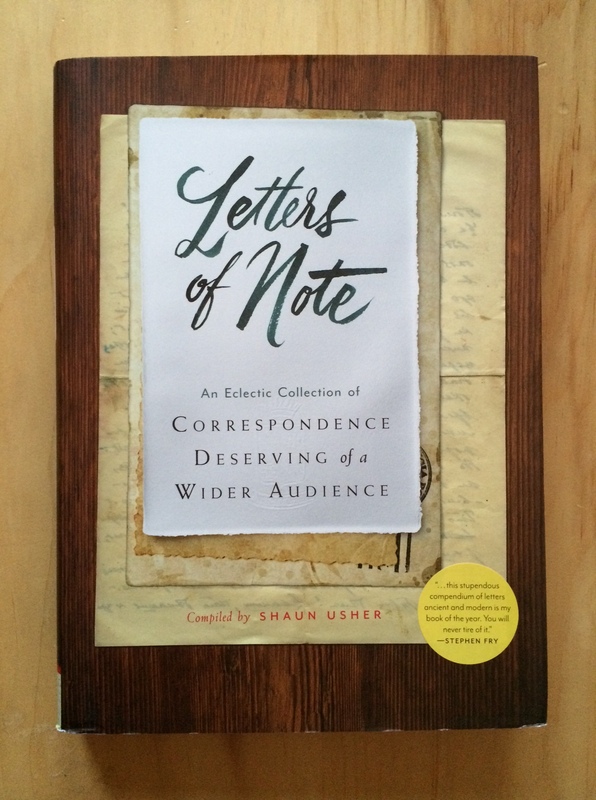 Shaun Usher, who runs the website Letters of Note (a Rosemary & Reading Glasses favorite) collects letters old and new, famous and not, and includes photocopies (and transcriptions, if needed) of the missives. It’s glorious. Anyway, I’ve decided to join the movement to keep letters alive (to a particular uncle: I’m late to the party, I know! )—perhaps you’re already on board? Let me know! What a good idea to pair these two books together as a gift (perhaps with a thoughtful letter too!). I love writing letters although so rarely do these days (I still write postcards though). I love receiving them even more. Wonderful review. Thank you, Letizia! You’re right– a letter (and maybe some stationery?) would make a lovely addition. BTW, I would love one of you and your son’s handmade cards, and I would love to get your address so I can send you a card, too, not unfortunately handmade. I think you’d love this book; he does address the question of digital archives in later chapters. I’d love to exchange chards! I will email you with our address! I bet the ones you wrote are just lovely, Naomi! How lovely that you’ve saved all your correspondence! I admit to being envious of your pen pals. Thank you for kick-starting me on a letter I’ve been meaning to put on paper for a month. I also love doing holiday cards, but boxes of cards don’t really exist here. I may be motivated enough by this post to go get some crafting supplies this weekend and make my own. No boxes of cards? You’d think the French would be all over the joyeux de noel and what-not. Are you going home for Christmas? Sadly, I am not, having just gotten here. Next year! And no, no boxes of cards — it’s easy to find single cards but for 2-5 euros apiece I cannot afford to send them to Everyone I Know. Christmas here is surprisingly subdued, though many German traditions are becoming widespread (like Christmas markets). Well, except for the food, which is a huge deal. It really drives home how much of our American holiday is derived from northern Europe.